I have words, y’all. Great words. And I put those words in a book. A great book. I also have paintings, y’all. Great paintings. And I put those paintings in the same book, which makes it not just a great book, but a fanfreakingtastic book. You have friends and family, y’all. Great friends and family. You know what they need for holidays? My book (if you didn’t see that coming, I’m worried about you). What’s the book about? Life and stuff – mostly life with dementia. But you don’t need to have experience with dementia to relate to the book. Check out a summary and buy a print copy here. Or read reviews and buy an eBook here (you can also buy a print copy here, but I make virtually nothing on sales on Amazon, so it’d be great – and cheaper for you – to buy them copies through my website). I Have a Face For Radio, So Tune In! Hey there, shiny, happy people! On Saturday (4/8/17) at noon (EST), I’m going to be on Choice Radio Network being interviewed by Linda Burhans of Linda’s Caregiver Connections. You can read about her show here and listen live here. I believe you can listen to archived shows on her site (http://www.connectingcaregiversradio.com/), so if you’re not able to listen live, hopefully you can listen later. As you listen, imagine me prettier and thinner than I am in real life. And imagine that I smell like I took a shower sometime in the last week. God, I love radio. And imagine me sipping a bourbon martini glamorously while we chat. Okay, maybe a bourbon martini wasn’t a thing until now, but I trust you kickass people to make it happen. So expect good things. Hope you can tune in! I swapped books with an author of a dementia care book recently, and I’m relieved to be able to say that it’s great! It’s always a risky endeavor because you never know if you’ll like the other author’s book. Luckily, Rachael Wonderlin’s book, When Someone You Know Is Living in a Dementia Community, is well-written and she definitely “gets it.” It’s full of tips about how to have good visits with someone in a dementia care facility, how to deal with staff, how to keep someone with dementia happy and reduce their anxiety, and how to make interactions with them rewarding for you, too. Rachael has worked at several dementia care units and clearly loves working with this population. She’s a good problem solver and has a lot of patience and empathy. I highly recommend picking up a copy if you know someone with dementia or know a caregiver of someone with dementia. She also has a blog called Dementia by Day. You can buy a copy of her book on Amazon here. It’s called Fractured Memories: Because Demented People Need Love, Too. Basically, in 2009, my dad was diagnosed at the age of 65 with frontotemporal dementia, a form of dementia that strikes early and progresses more quickly than Alzheimer’s, and for which there is no treatment to slow the progression of the disease. Via art and on this blog, I began documenting my family’s heartbreaking and hilarious experiences. As a professional artist, I’ve often turned to art as a self-prescribed therapy to help deal with life’s trials. This battle was no different. 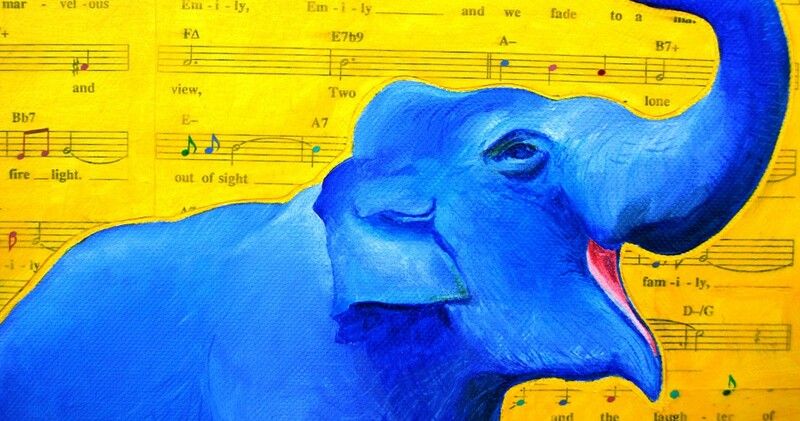 I utilized the elephant as a symbol for dementia (because an elephant never forgets), and incorporated sheet music into the paintings because my dad had been a musician. Eventually, I created 40 paintings that are included in the book. I began blogging about the range of issues that arose daily as the disease progressed, documenting everything from my own fear of getting dementia, to my dad’s transition to diapers (and the various places he opted to drop his drawers and just “go”), to combatting his compulsions like the need to “clean” the cars with steel wool, to an exploration of how he might have gotten the disease, to finding the right dementia care facility, to the best ways to make him giggle. I approached the disease from the fresh viewpoint of a younger caregiver. As my readership here grew, so did the suggestions from you awesome people that I turn the blog into a book. After hearing too many horror stories about traditional publishing contracts, I decided to self-publish. I ran a fundraising campaign for my book and presold over 500 copies in less than a month. My dad was my best friend. He embraced the ridiculous, looked for the good in people, and mentored and helped people whenever he could. Following his diagnosis, when people asked how he was doing, he’d answer, ‘Not bad for a demented guy.’ He looked for the light hiding amidst the pain. He chose to be very open about what he was going through in the hopes that it would help other people cope with their own diagnosis or a loved one’s diagnosis. Writing this book seemed a fitting way to honor that legacy. I tried not to shy away from the ugly, raw emotion of life with dementia, but I also looked for the laughter where it could be found. Rest assured, you will love my father as much as I do when the book is done, and perhaps gain some insight about how to cope with your own loved one’s dementia or how to support a caregiver. Buy a paperback copy directly from me at http://shop.emilypageart.com/. When you buy it from me, you save a couple bucks and I make more on each book. Win win. And if you tell me you’ve ordered and tell me a terrible joke on any of my posts on the blog after you’ve placed your order, I’ll sign your copy with a terrible joke in return. Win win terrible win. Buy a hardcover or paperback copy off of Amazon here. Buy an eBook here or here. And when you’ve had a chance to read it, and if you like it, please consider leaving a good review on GoodReads or Amazon or the stall door at Starbucks (only on a piece of paper taped to the door, please don’t vandalize). And then make sure your local caregiver and/or dementia support groups know about it. If you read it and don’t like it, please lie.